Supporting chemical reactor with real-time anomaly detection. Following the Industry 4.0 trend, industrial grade chemical reactors tend nowadays to be equipped with sensors that are tracking different parameters such as temperature, use of vacuum, nitrogen, water vapor. In these configurations, sensors are producing time-series data that can be used to perform automated detection of abnormal events and to monitor the chemical reactions. Abnormal events have heterogeneous sources such as human errors, valves malfunctions or exhaustion of energy sources. Abnormal situations can go undetected and may lead to bad quality of production or even dangerous situations. 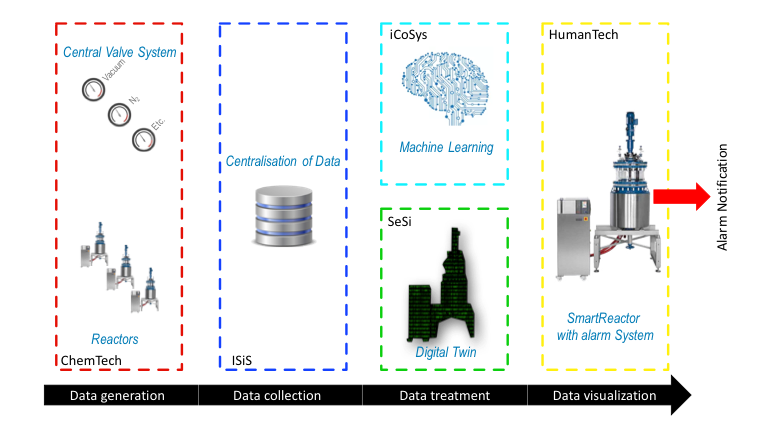 SmartReactor is a multi-institute project, where iCoSys is more specifically interested in the analysis the time-series data using versatile machine learning approaches allowing to identify abnormal events (WP5). The final implementation will aim at detecting such events as soon as possible and trigger alarms for the operators of the chemical reactors. Two challenges are tackled in this project. The first one is about the analysis and design of machine learning algorithms able to detect abnormalities that are diverse and rare. The second one about the alarm system in itself that has to cope with different degree of alarms and their relay to notification systems.